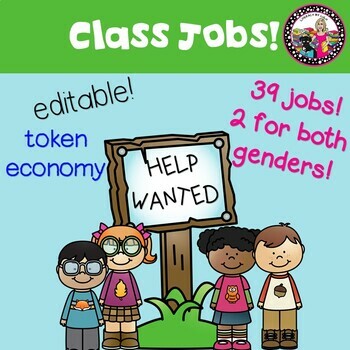 Class Jobs *EDITABLE* and MORE! Token Economy too! Want a way to manage behavior while providing responsibility? My class jobs is your ticket to success! A Boy and Girl for EVERY job! Token Economy! Editable file! It’s here! Class jobs with salaries and fines! This is such an effective system that actually puts the “policing” in the hands of your students. Not all jobs have the ability to "fine" and not all jobs have the same salary. All students would start with the same number of tokens. I would start with 10. The job cards come with the job title, the responsibilities and a place for you to add a salary that you deem appropriate. I always had different salaries depending on the job. My classroom library was a focal point of my room so the librarian job had a much bigger salary than the rest. I have used play money (pennies) and I have also spray painted lima beans gold and used those. There are 39 jobs for your students to choose from as well as a tracking sheet for you to know who has had which job. I would print the cards on card stock and laminate. The jobs are 3 x 5 index card size and can fit perfectly into your library pockets that you have labeled with your students’ names. These pockets can then go on a bulletin board for the entire year. All you have to do is change the jobs! 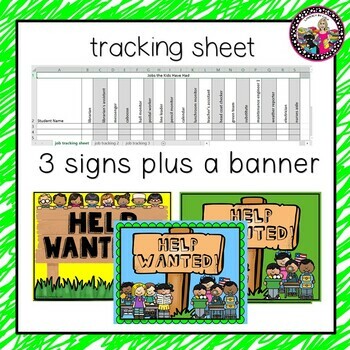 The editable tracking sheet allows you add the names of your students and then you can either print the sheet or keep it right on your computer. Also included are I.O.U forms for a student who may become in debt. 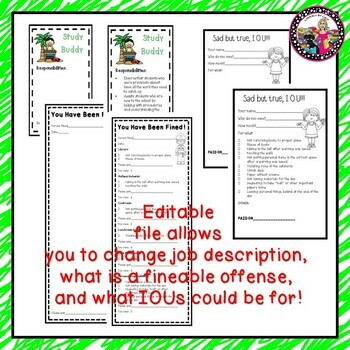 The I.O.Us, the fines, and the job cards are editable. In one set, I have written the title and the responsibilities but left the salary space blank so you can add that in. In the other set, I have taken off the responsibilities so that you can type in what you want the responsibilities to be. I have created three different signs that you can use with your bulletin board. "How to Set Up and Effective Token Economy System” that provides useful tips. Please check out the preview to get a full understanding! This system really works if you do it with fidelity and the kids benefit from learning how to budget their “money” and look forward to redeeming their “money” for small prizes. I have used this system with first and third graders but could easily be used in other elementary grades. 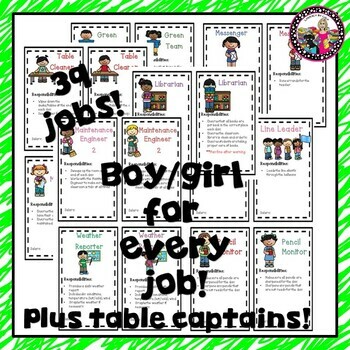 Below are the jobs included in this set and remember each job has both a boy and a girl featured so that it is equitable. There are also four bonus jobs that you can add the title, description, and salary too. Ice Breakers and Community Builder ALL YEAR LONG! Candy Bar Wrappers! Beginning of the year! **Don't forget that when you purchase a product from TPT, and you rate it, you get TPT credits---That means dollars for YOU!! !